Now, at this point, I was going to start working on one of my favorite themes; namely, the confluence of advanced technology and ancient religions. I could have mentioned that the Mullah might be reading some holy book on an e-book reader obtained from the App Store, and then have mentioned Frank Herbert's space-saving filament paper book from his 1965 megahit Dune. Alternatively, I might have speculated that the Mullah was using an app for his iPhone to contribute money to a mosque; in which case, I'd mention the Pray-o-Mat, an automated religious artifact from Roger Zelazny's 1967 novel Lord of Light. 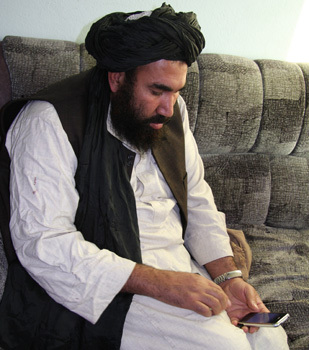 However, I decided to go a bit edgier, and wonder if the Mullah was looking through the App Store trying to find something like the cell phone application used by terrorists in the recent movie Vantage Point. 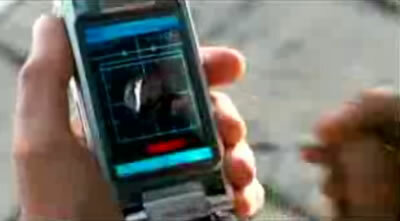 In the film, the bad guy actually aims a gun by remote control via his cellphone (as shown in the picture below; note the primitive stylus). It was then that I discovered this actual iPhone application that can aim and remote fire a Nerf missile launcher. From Python Interfacing a USB Missile Launcher (via hack-a-day) and iPhones and the Taliban (via The Raw Feed).